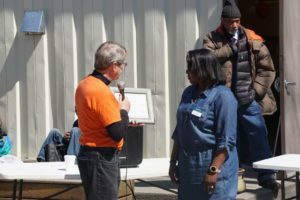 On Sunday, March 24th, the last meals were served from the Oak City Outreach Center. For almost five years, the City of Raleigh, the Raleigh Wake Partnership to End and Prevent Homelessness, the Raleigh Police Department, and Catholic Charities have collaborated to make the Center a success. During that time, nearly 400,000 meals were shared with individuals experiencing homelessness and hunger on weekends. 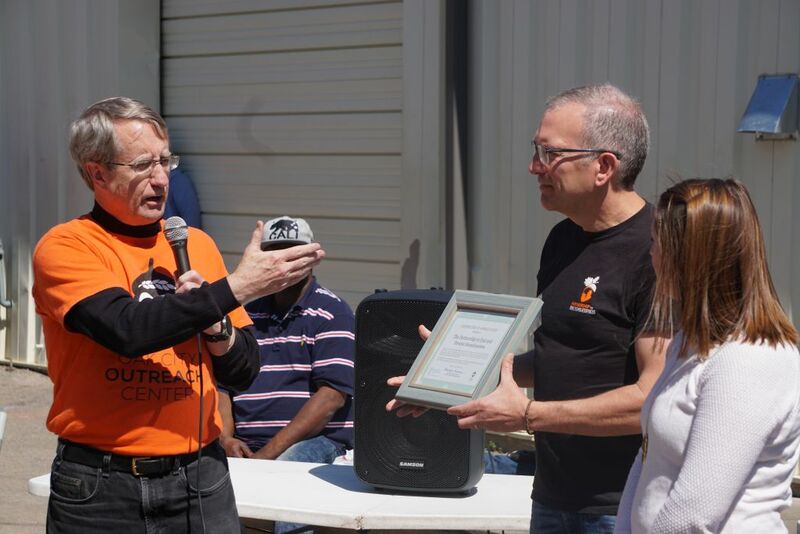 “What exceeded expectations was the energy and the warmth of all the volunteers and support from the partnership working with Catholic Charities.” shared Scott Payne, Assistant Director of the Raleigh Parks, Recreation and Cultural Resources Department. In 2013, the City of Raleigh and the Raleigh Wake Partnership to End and Prevent Homelessness came together to develop a plan for improving the way the Raleigh community serves individuals experiencing homelessness. The plan resulted in two program ideas. 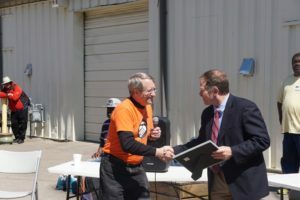 The first was a short-term solution to improve the way meals were being shared on weekends in Moore Square, which led to the formation of the Oak City Outreach Center operated by Catholic Charities. The second, a long-term solution, would be a collaboration of multiple community partners over several years addressing core issues of homelessness. 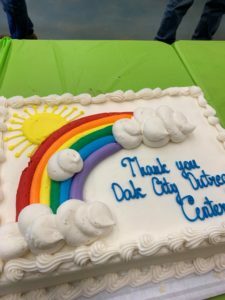 As the operator of the Oak City Outreach Center, Catholic Charities worked with community agencies to coordinate groups to share meals at the Center in an organized way. Catholic Charities also worked with individual volunteers to ensure everyone had a way of giving back through the Oak City Outreach Center. One key partnership that Catholic Charities formed from the beginning was with the Raleigh Police Department. When the Center opened, 25 community partners distributed 746 meals during the first weekend. 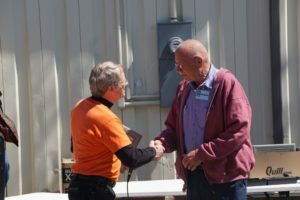 Over the past 4 1/2 years, the Center has grown and now has over 70 community partners and over 1,000 volunteers, who serve more than 1,500 meals each weekend. 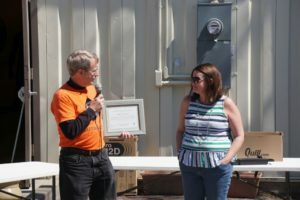 On Sunday, the culmination of the hard work and success was celebrated with Catholic Charities presenting certificates of appreciation to the City of Raleigh, the Raleigh Police Department, the Partnership, volunteers and Catholic Charities staff. With the success of the Oak City Outreach Center, came the second phase to addressing the issue of homelessness in the Wake County Community. Catholic Charities will again take the lead in providing more comprehensive services to individuals experiencing homelessness as the operator of Oak City Cares. 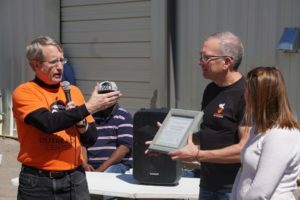 The goal of Oak City Cares is to make homelessness rare, brief, and non-recurring in Wake County by quickly and effectively connecting people with the services that will help them secure housing, find employment, and improve their health. 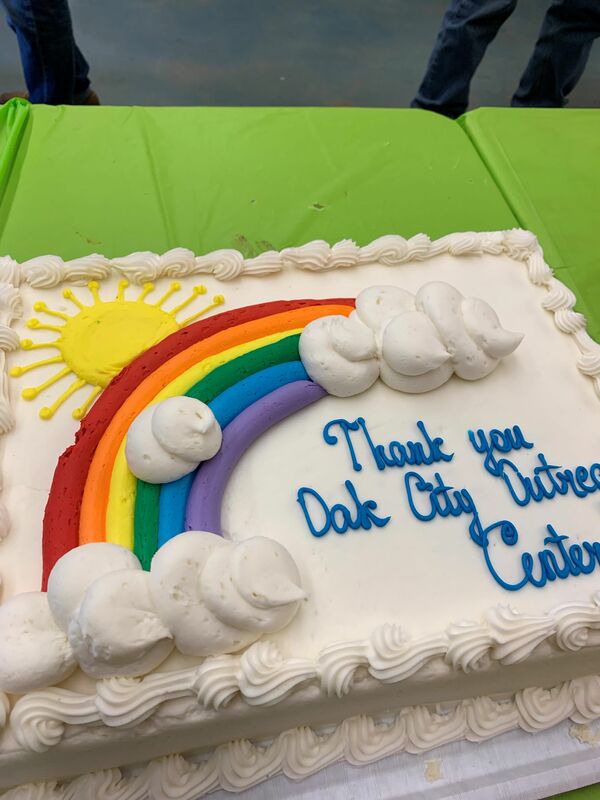 Making Oak City Cares possible are Wake County and the City of Raleigh who contributed a combined $10.4 million to purchase and renovate a facility at 1430 South Wilmington Street in downtown Raleigh. Beginning Saturday, March 30th, weekend meal sharing will become part of the new Oak City Cares program, with additional supportive services beginning on Wednesday, April 10th. 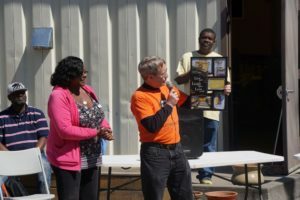 “The steps that have been taken between so many partners at the table really speaks to providing not just a building created with bricks and mortar, but to afford our community an opportunity to see and know what resources are available for them in a one stop shop, and address some of those other needs beyond not having a meal to eat,” shared Chief Deck-Brown. On Monday, April 8th Oak City Cares will hold a ribbon cutting to celebrate the program opening. More details about the ribbon cutting can be found at www.CatholicCharitiesRaleigh.org/OCC-Ribbon-Cutting. 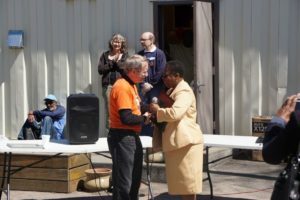 For more information about how to access services or to support Oak City Cares, please visit www.OakCityCares.org.